"The odor of animal feces and ammonia permeated the inside of the residence, which caused several of the responders to experience dizziness and nausea." ABC NewsDonna Roberts and some of the dogs rescued from her home. 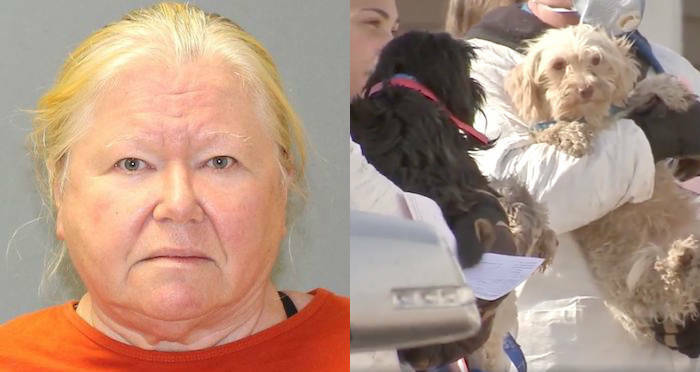 New Jersey State Police arrested a woman on Nov. 13 after 44 dead dogs were reportedly found wrapped in plastic and kept in various freezers in her home. An additional 161 living dogs were also found in the home and being kept in deplorable conditions. Authorities arrested 65-year-old Donna Roberts and charged her with animal cruelty after discovering both the living and deceased animals on her property in Shamong Township. It’s unclear why Roberts kept the deceased dogs frozen or what she planned to do with their preserved remains. Detectives said that after coming in to assist the Burlington County Health Department with an inspection of Roberts’ home, they found “evidence of animal cruelty inflicted upon various breeds of dogs on the property,” according to the statement that New Jersey State Police wrote in a Facebook post. “The odor of animal feces and ammonia permeated the inside of the residence, which caused several of the responders to experience dizziness and nausea,” the post stated. Apparently, neighbors of Roberts’ have wanted authorities to seize these animals from her property for quite some time. Out of the 161 living dogs, NBC News reported that four of them were found in critical condition and were transported to an emergency veterinary care unit. Authorities stated that the other dogs were evaluated and treated at the scene by animal shelter employees. The health department had been calling residencies in Shamong Township after new ordinances were adopted concerning the housing of animals. When a phone call to Roberts’ home concerned health officials, they sought a search warrant to inspect her home. ABC NewsAuthorities responding to the scene at Roberts’ property. What they found was likely beyond what authorities from both the health department and the state police could have imagined. “We are appalled by the horrendous conditions these dogs were subjected to, and as a result, I authorized charges against the property owner, Donna Roberts,” said Callahan. After on-site evaluations, the 161 recovered dogs were transported to various shelters across the Delaware Valley where they’ll likely be put up for adoption. Following her arrest, Roberts was released by authorities with a court date pending. If found guilty, Roberts could face up to six months in prison and fine of up to $1,000. But with the incredible quantity of dogs that Roberts allegedly neglected and mistreated, and given the fact that 44 of these dogs were found in freezers for whatever reason, the court could see cause to make her punishment more severe. Next, read this story about a man that was arrested for allegedly “de-barking” his dogs. Then, check out this story about a dog that accidentally shot his owner while on a hunting trip in New Mexico. Wisconsin Company Gives Each Of Their Employees A Gun For Christmas, Owner Calls It "The Perfect Gift"